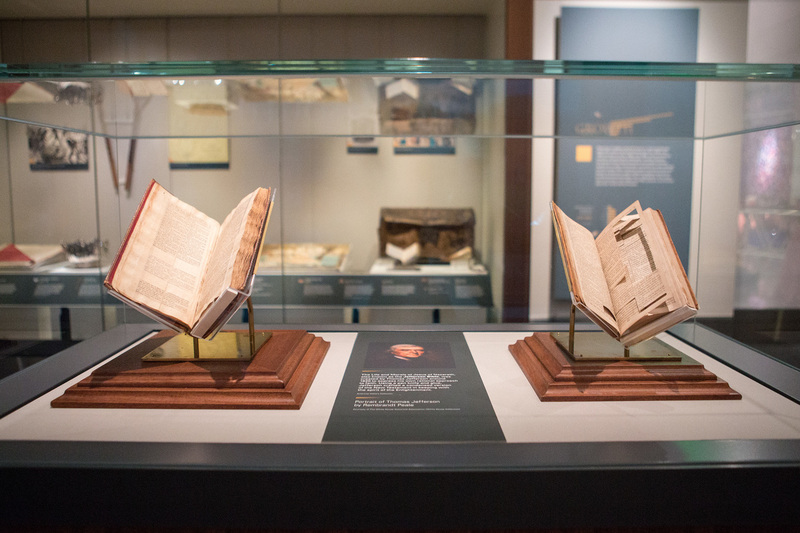 To Understand How Religion Shapes America, Look To Its Early Days From Thomas Jefferson's cut-up Bible to the country's first printed hymnal, the Smithsonian's Religion in Early America exhibit wants to engage Americans with the role of religion in its first days. A plethora of religious iconography fill the National Museum of American History's new exhibit, Religion in Early America. From left to right, an 18th century Torah scroll, a 17th century Catholic cross and a children's Noah's Ark playset from 1828 sit on display. America's exceptional commitment to religious freedom stems from the diversity of its faith traditions. The rebellious attitudes prevalent in frontier settlements fostered the growth of evangelical movements. African slaves introduced Islam to America. The drive to abolish slavery was led largely by Christian preachers. 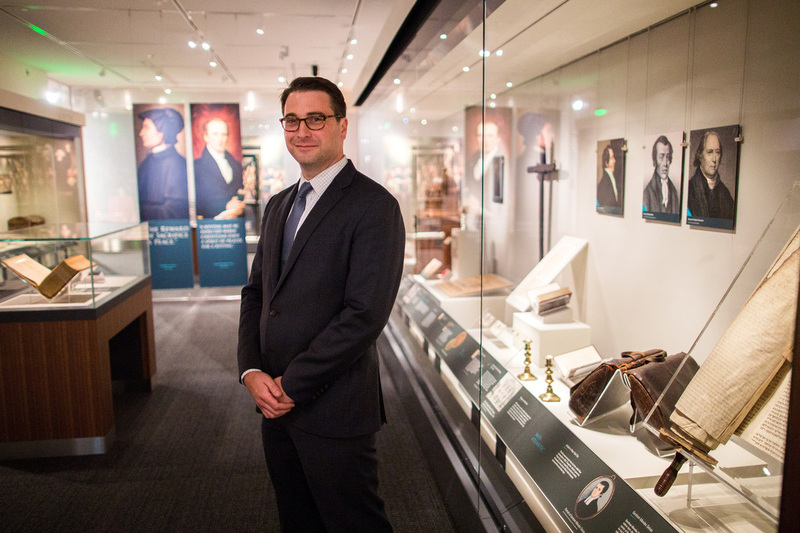 Religion curator Peter Manseau stands in the National Museum of American History's new exhibit, Religion in Early America. "We can't tell the story of America without telling the story of religion," Manseau says, "and we can't answer questions about the importance of religion today without going back to earlier generations." Manseau's appointment as curator and his inaugural Religion in Early America exhibit signal "the beginning of a renewed engagement with the role of religion in American history," according to John L. Gray, the museum director. Each of the objects in Manseau's exhibit adds a special dimension to the larger narrative. 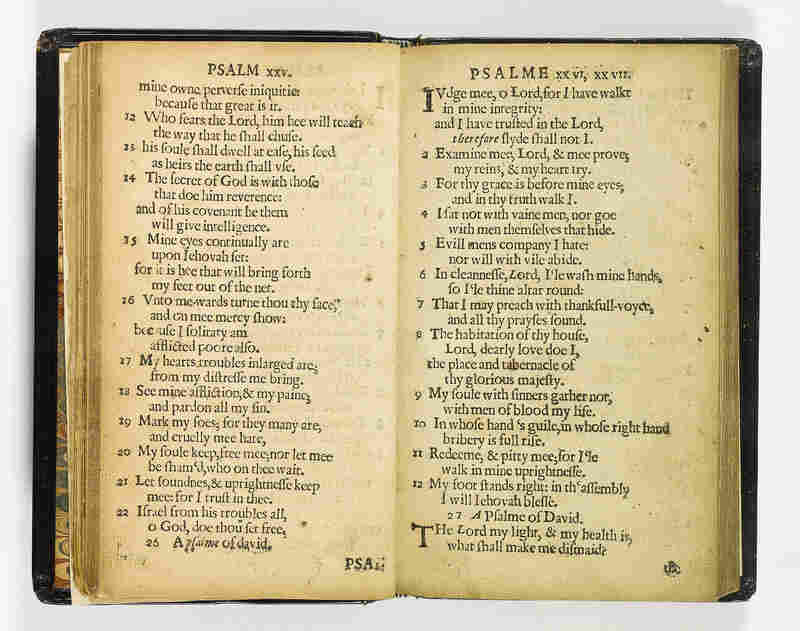 The Bay Psalm Book, also known as The Whole Booke of Psalmes Faithfully Translated into English Metre, was the first hymnal printed in America, 1640. The oldest item in the collection is the Bay Psalm Book, a translation of the Psalms assembled by a team of educated Puritans in the Massachusetts Bay Colony in 1640. The Puritans split from the Church of England, determined to purify the practice of their faith. The only songs they allowed in their worship were the Psalms, but they needed a Psalm book for their services. "It's a great example of the do-it-yourself approach to American religion that you see again and again," says Manseau, who holds a Ph.D. in the history of religion from Georgetown University and is the author of several books. "Separated from the cultures in which these traditions were born, there's a need to improvise, a need to make things new, with the materials at hand." The persecution that Puritans faced in England was a key factor driving them to the New World. So it also was with Quakers, Baptists, Shakers, Jews, and other religious minorities, all of whom saw America as a place they would finally be free to practice their faith. "This country, somewhat uniquely, is a nation of transplanted religions," Manseau says, "interacting with the beliefs and practices that were here, but also with new traditions coming in, learning and needing to negotiate, to compromise, and finding ways to live together. The practical implication of this diversity was religious freedom and the disestablishment of any particular church." A six-foot-tall pulpit that George Whitefield, an outspoken and controversial preacher, carried around because he was not allowed inside many churches. The idea of rebelling against conventionally practiced religion is a big part of America's faith history. George Whitefield, an Anglican minister from England, was such an outspoken and controversial preacher that he was not welcome in most churches, so he built his own pulpit and took it on the road, preaching outdoors to crowds that numbered in the thousands. 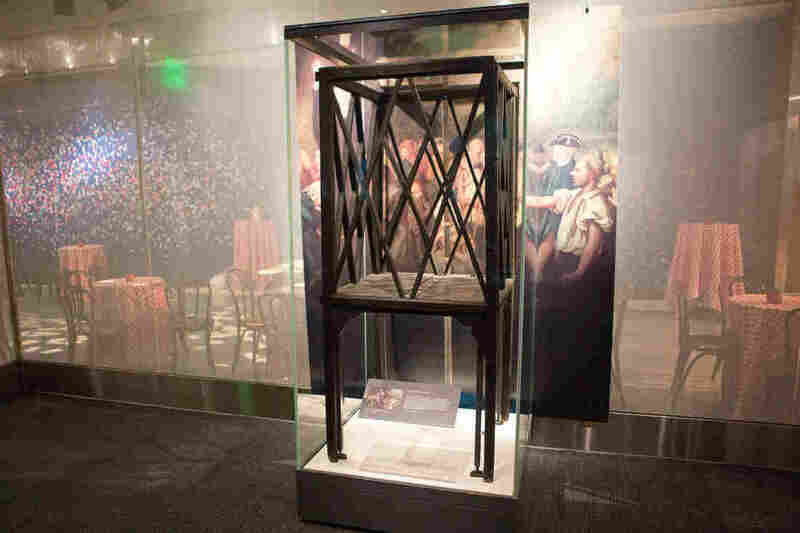 Whitefield's portable pulpit, about six feet tall, with hinged sides, is in the Smithsonian exhibit. "You could fold it up and strap it to the side of a horse or throw it in the back of a cart," Manseau notes. The itinerant preacher is believed to have used it about 2,000 times, thus pioneering the great revival meetings that became a key feature of evangelical Christianity in the United States. Whitefield's popular appeal demonstrated the deep religiosity of many Americans in the colonial era, but some of their founding fathers weren't so devout. As a man of reason, Thomas Jefferson struggled with Christianity, trying to reconcile the teachings of Jesus with the ideals of the Enlightenment. His idea was to edit the Bible, literally. The Life and Morals of Jesus of Nazareth, left, was created by Thomas Jefferson to express his own rational approach to faith. Using a pen knife and glue, Jefferson crafted a condensed version of the New Testament, right, in keeping with the spirit of the Enlightenment. Working in the four languages familiar to him – English, French, Greek, and Latin – Jefferson went through several copies of the New Testament, following the scripture closely. "With a pen knife, he would remove those sections that he agreed with and found useful, and then he glued them together in this four-column book," Manseau says, pointing to a yellowing cut-and-pasted Bible in a display case, "one column for each language." Jefferson called his version of the New Testament "The Life and Morals of Jesus of Nazareth." The Smithsonian exhibit includes one of the Bibles that Jefferson cut apart, as well as the one he created from his pasted clippings. With his rendering, Jefferson offered a New Testament narrative he found preferable to the original. "Jefferson saw himself as a Christian in what he thought was the truest sense, as one who saw Jesus as a moral exemplar and a teacher," Manseau says. "He didn't have any use for miracles or the supernatural, which he took to be additions added to the story later on." Notably, Jefferson's version ends with Jesus being buried and does not include the Resurrection. 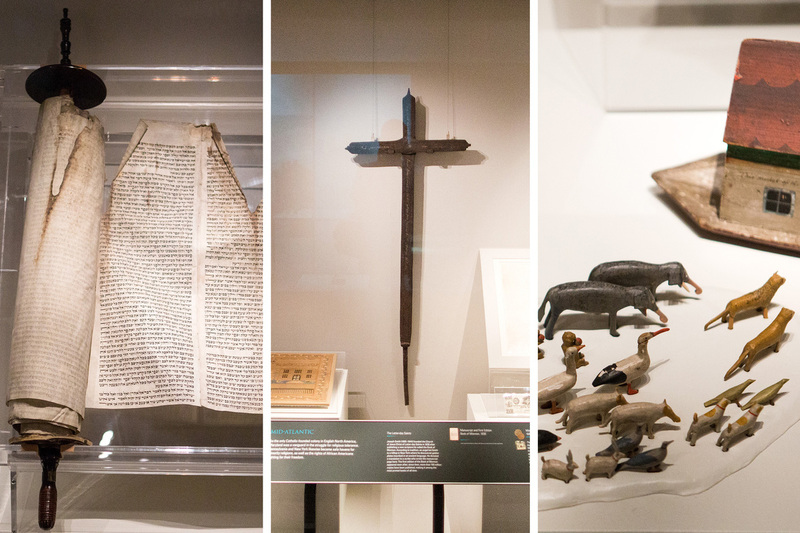 Though America is often portrayed as a Christian nation, its religious history is more complex, as the exhibit makes clear. Many of the African slaves brought to America were Muslims. Some were literate in Arabic, and did their best to maintain their faith. 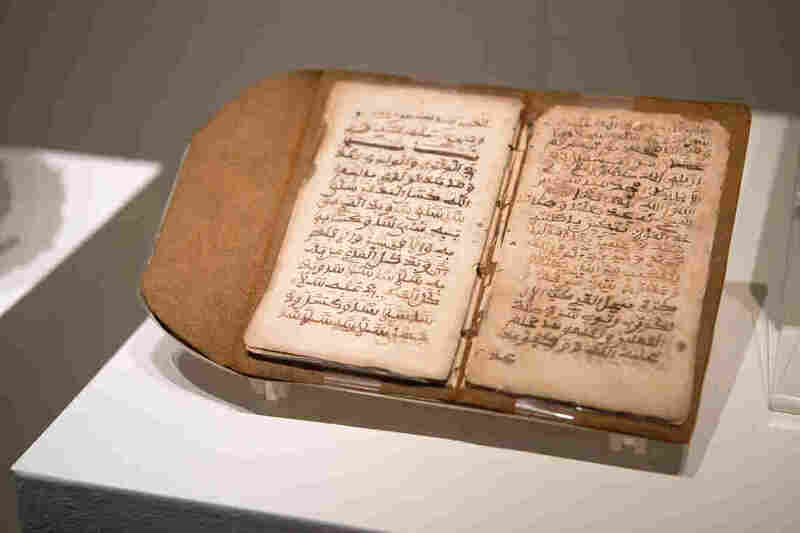 One, a man named Bilali Muhammed, wrote a thirteen page text in Arabic, which has been preserved and is displayed in the exhibit. Brought to America as a slave, Bilali Muhammed wrote this 13-page Muslim text in Arabic. "It is a very simple document," Manseau says. "It contains some basics of Islamic practice, [such as] 'These are the times at which we pray. This is why we wash our hands. This is why we wash our feet before we pray.'" Manseau does not read Arabic, but scholars have told him the text includes only "snatches" of quoted text from the Quran. "The text appears to have been written by someone who was in the process of forgetting," Manseau says, "trying his best to hold on to what he once knew. There are basic ideas of, 'This is what I want to pass on to my children if they're going to learn to be Muslims,' as well as words of praise to Allah, despite the circumstances." 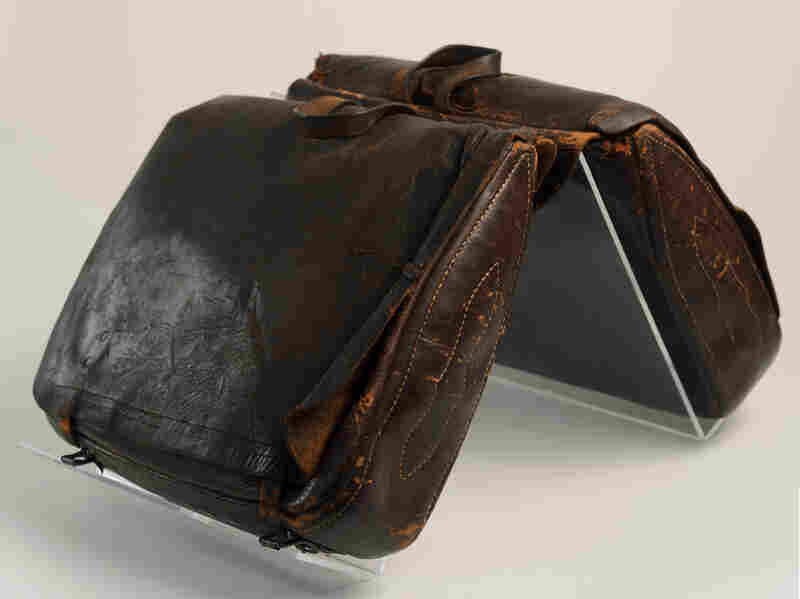 A former slave owner, Freeborn Garrettson freed his slaves and became an abolitionist preacher, traveling with these saddlebags as he visited plantations. Religious faith, in fact, was key to the abolition of slavery. The Religion in Early America exhibit tells that story in part through a pair of saddlebags, once belonging to a former slaveholder named Freeborn Garretson, a plantation owner and man of wealth in Maryland. Garretson was also a religious man, and one Sunday morning, while reading the Bible, he was suddenly struck by a thought from above, which he interpreted as the voice of God, commanding him to let his slaves go free. From that day on, Garretson was a committed abolitionist and spent the rest of his days as an itinerant minister, traveling on horseback from plantation to plantation, preaching the evils of slavery and trying to convince other slaveowners that they were violating God's will. Garretson's saddlebags are on display in the exhibit as, in Manseau's words, "the iconic objects of itinerant preachers throughout early America. " He says Garretson carried Christian tracts in the bags, as well as pro-abolition writings which he shared with the people whose opinions he was hoping to change. The "Religion in Early America" exhibits will continue at the Smithsonian's National Museum of American History for a full year. One of the photos with this report has been replaced. That was not the Bay Psalm Book in the image. The photo that is now on this page is of the Bay Psalm Book.